Sensor Selection, Set-up, and Troubleshooting | MaxBotix Inc. 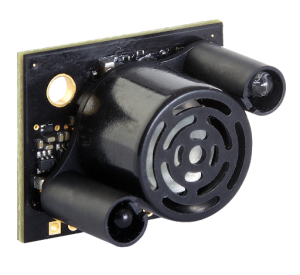 When choosing an ultrasonic sensor, it is important to be aware of the surrounding environment. Consider if you will be using your sensor indoors or outdoors and where it will be used in that area. Many of our sensors come with an IP67 rating and are rated for use in many environments. At the same time, we offer a variety of sensors with an open-faced transducer that do not have this rating. Ensure that you are using an IP67-rated sensor if it will come in contact with moisture, dust, or harsh handling. Our IP67-rated sensors have a closed-faced transducer, which provides protection where there will be moisture, dust and harsh handling or weather. Considering the environment surrounding your sensor will help ensure its longevity. To learn more about environments, read about Protected vs. Non-Protected Environments. Supply power to your sensor by using a power supply and mini grabbers or wires. 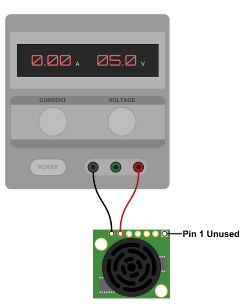 The standard input power should be +5V DC. Pin 6 on the sensor is V+ and Pin 7 is GRD. 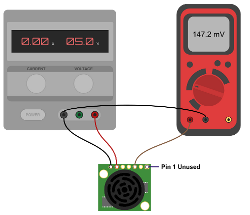 One of the easiest outputs to use is the analog voltage (AN) output. If you plan on using this output, connect to the AN output which is Pin 3. To learn more about setting up your sensor, read the Quick Start Guide. Different frequencies provide different levels of detection to a number of targets. When operating at the right frequency, ultrasonic waves can pass through solid objects and detect only specified materials. MaxBotix Inc., sensors operate at 42kHz which allows our sensors to detect solid and liquid targets. Figure 3 shows how the 42kHz sound waves are reflected back to the sensor from targets. To learn more about sensor sound waves, read An Introduction to the 42kHz Sound Wave. MaxBotix Inc., provides beam patterns to assist our users in understanding the detection area of a sensor by showing the typical detection for given target sizes. Our beam patterns are designed to help you determine the relative detection zones needed for your application. To learn more about our product beam patterns, read this article: Reading MaxSonar® Sensor Beam Patterns. There are a number of ways to use multiple sensors for detection in an application. Free-run operation is only suggested on select sensor models because without certain features, multiple sensor operating in the same environment causes interference from the other sensors. One sensor may be in transmitting mode while another sensor is in receiving mode. Simultaneous operation works in a number of applications and can be achieved by connecting all RX lines together however you should verify this for your application. Sequentially reading each sensor works in nearly every application. This happens by triggering the first sensor to range which will allow each device to range only after the previous device has finished and there will not be any interference between sensors. Another option is continuous looping which works like the sequential triggering, but continues to loop without repeated external triggering. To learn more about setting up these different operation methods, read this article on Using Multiple MaxSonar® Sensors. When your sensor reports unstable range readings, it may be due to electrical noise, mechanical noise, or perhaps the size of the target the sensor is trying to detect. One common solution is a power filter that will help reduce the effect of electrical noise. Proper mounting should be evaluated to determine if it is a mechanical issue. Finally, if the sensor you are using is not detecting the target, you may need to look into a different model or type of sensor. To learn more about troubleshooting your sensor, read the MaxSonar®Troubleshooting Guide. Technical support services help to propose solutions after identifying sensor problems, wiring, and mounting as well as application-based sensor selection. First, we recommend that you try troubleshooting your sensor and if that does not work, contact the MaxBotix Inc., technical support team. You may be asked to send information on the specific issue you are having with your sensor. The more information you are able to provide, the better the insight the support team has to assist you. To learn more details about technical support, read the Tech Support article. Contact our technical support team if you need any additional help or have any questions about sensor selection or technical support. We are here to help you succeed.